In setting out to bring the words of both Walt Whitman and Walter Mosley to life, I did not realize the extent to which I was taking on what has proved to be a thoroughly challenging and fulfilling work. The texts of Futureland and “I Sing the Body Electric” exist, for some, on completely different planes of literature. However, I set out to position these texts together as they form an interesting critique on the issue of Black embodiment. Specifically, these texts form an indictment on the systems of racism that surround Black people in America and point out the hypocrisy of the American ideals held up by Whitman through his poetry by clearly displaying how the act of racializing a body rends it apart from the soul. In other words, when systems of racial oppression operate on a human body, in order to survive the onslaught of ––– Black people sometimes provide themselves with an emotional distance between the way their body is perceived by others and their own personal worth. While this emotional distancing is good in that in many cases it saves lives, it also is a coping mechanism that puts up a barrier between the Black body and the soul that resides there. In this way, Whitman’s philosophies on embodiment are rendered moot for Black people in the shadow of America’s system of racialized oppression. In reflection, and as I detail the process and results of my project below, I have found that this topic can be quite deftly portrayed through artistic media, like music. However, to engage in a work of art with such an aim is also a huge undertaking, as the issue of clarity in form and in word is of the utmost importance. As I will talk about below, this has been a very fruitful project both personally and academically, but it is also one that has not come without its own set of challenges. The main achievement of this project rests in the lyrics – which I have attached in two forms. It took an incredible amount of effort to find the common ground that the Whitman and Mosley texts share without the use of regular prose. When constructing the lyrics, therefore, I relied on two criteria in most cases: my sense of the text’s rhythm and clarity of voice. The cadence of the language was used to determine which sections of language to keep adjacent to each other and which to reposition in time. Alternatively, the tone of voice and style of writing informed which sections of writing, internal to each original text, could be maintained or not. For example, the lines that mention or imply the first person – the ‘I’ in Whitman’s poetry – has been left out, and along with it, almost all of the questions, as they almost invariably break the characterization of the auction block atmosphere I am trying to establish at the beginning. From Futureland I included the passages that dialogical in nature. This establishes a clear sense of a person who is singing these lines, rather than a third person account of what is going on. Keeping that narrative arc in first person allows for a direct interpolation of the listener into the narrative of the story, hopefully adding to the emotional weight of the lyric and piece as a whole. 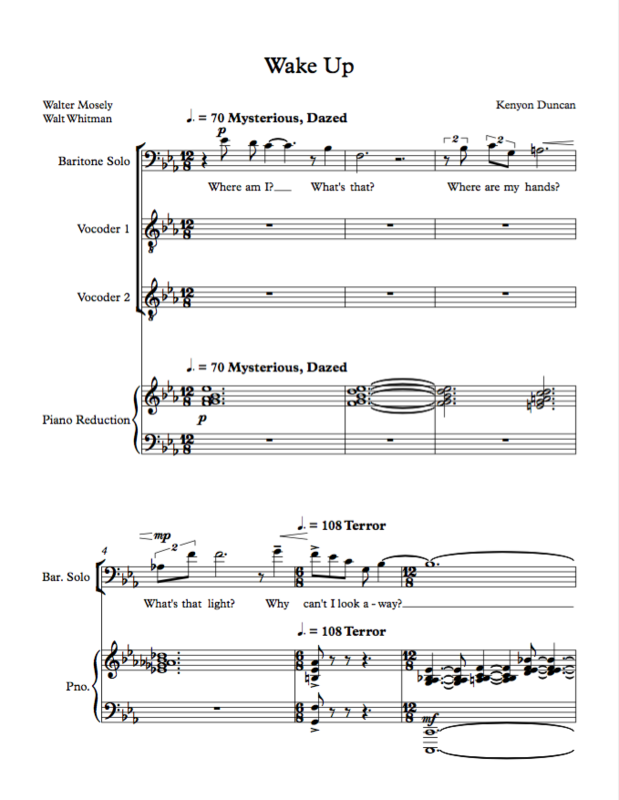 In addition, though I did not set any of the prose of Futureland directly to music, I channeled it into my musical understanding of the atmosphere that surrounds the piece. To this effect I’ve included one of the passages that has formed my musical understanding of the piece in the lyric sheet. The reason I have included two different layouts of the lyrics here is to highlight the multiple layers of composition that are in textual play with each other. In the typed document format, the lyrics tell a linear story. Starting with excerpts from “Whispers in the Dark” the listener encounters a person who has just been commanded to wake up and does not know where they are, much less the state of their physical body. As the story progresses, the textual insertions of piece of the seventh stanza of “I Sing the Body Electric” position this person as the subject of an auction. As the narrative continues the texts come together to portray the psychophysical damage that our main character (intentionally neither male nor female) incurs by the devaluing of their body. The delayed addition of the 8th Stanza of Whitman’s poem heightens the texture of the piece and also generalizes the conflict from one that is between two people to one that is between a person and the society around them. The lyrics on Twine help to elucidate the non-linear elements of this story. 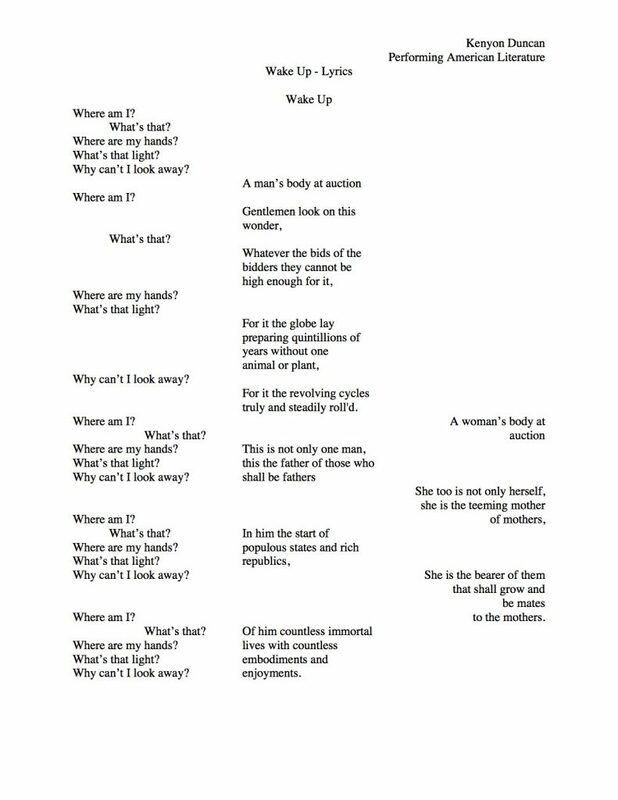 As shown in the above image, the connections between each piece of the lyrics are myriad and complicated, however it is in these connections that the real crux of the issue of embodiment can be found. For instance, the repeated words that open the piece “Where am I? What’s that? Where are my hands? What’s that light? Why can’t I look away?” create a linear progression on the typed page but a cyclical occurrence in Twine. 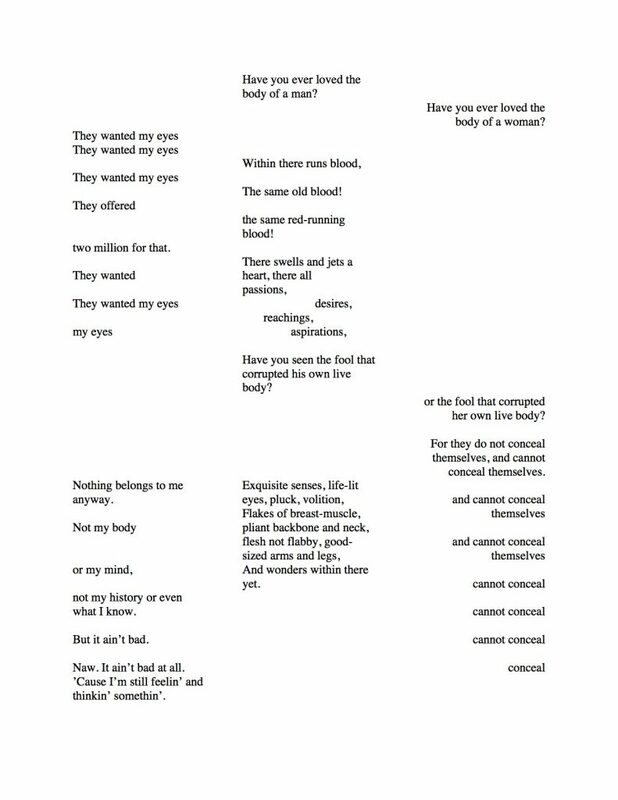 This cycle then spins itself out into violence as it is followed by the line “They wanted my eyes.” The Twine representation of the lyric was most useful in the construction process of this project. Though Twine is often used as a means of story presentation and interactivity. 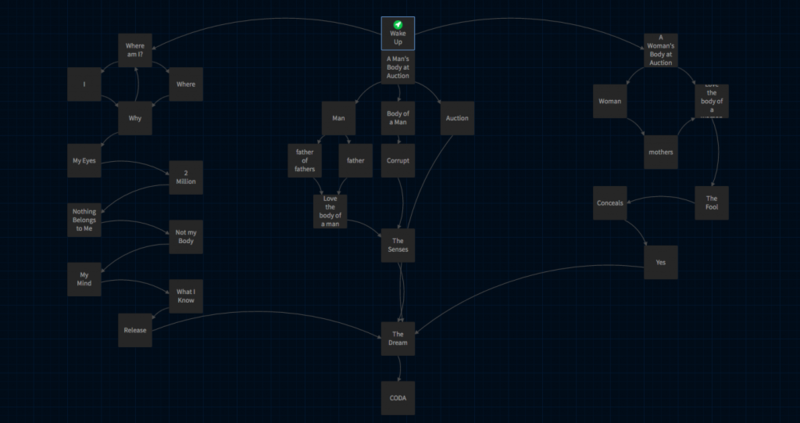 It was actually most helpful for me as a storyboarding tool, as it helped me spatially map this story onto itself. Included above is an image of the first few pages of music for this project. Currently the piece is scored for 1 Baritone singer and two instantiations of the vocoder I spent this semester working on. The same person should perform all of these voices – that of the Baritone and the vocoder(s). As I developed the piece and this stipulation became apparent, it was clear to me that this must be a recorded, digital work only as live performance is impossible. The recorded nature of this project also has enabled me to explore non-natural sounds (other synthesizers, drum samples, reverb/delay effects etc.) In an attempt to represent the rest of this musical content I have also included in my score a piano reduction of the rest of the musical context on which the voices rest. This project has allowed me to explore my own compositional abilities through the technique of recombination. 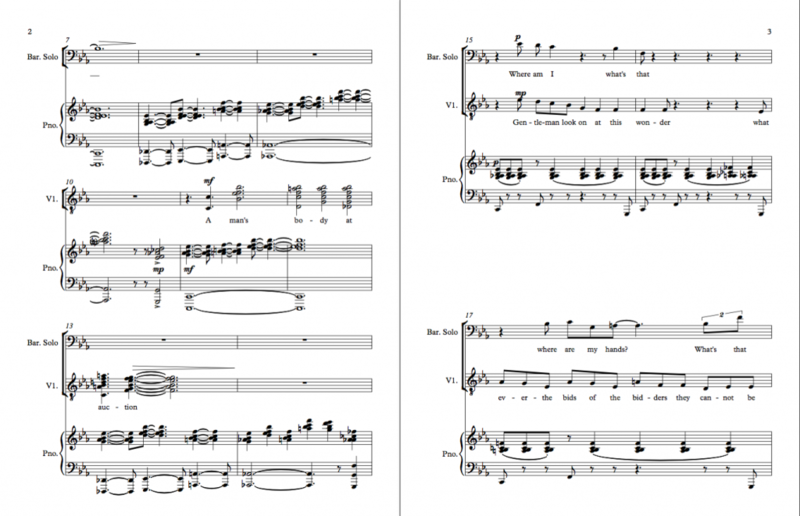 This methodology was of paramount importance while working on the music as in essence this entire piece is a recombination of two different texts. Musically this translated into driving rhythmic patterns and interlocking musical structures, which also harkens back to some of the Afrofuturist music I posted on my blog. In keeping with the idea of racism as work that separates the soul from the body, much of the musical language I am incorporating into the piece is intended to evoke the sensation of tearing and ripping – the visceral act of being severed from yourself. This translates into two types of dissonance that are predominant in the texture: harmonic dissonance and rhythmic dissonance. Harmonically, as is depicted in the piano reduction, the main element used is a series of cluster chords – chords that are made of notes very close to each other. This creates the sensation of blur in the texture, mirroring the main vocalist’s lack of direction and self-knowledge. The main form of rhythmic dissonance I employ is syncopation – the act of playing “off the beat.” This dislocation of the rhythm both creates a texture for the vocalist to sing over and also upends the traditional sense of meter, contributing to the confusion apparent at the outset of the piece. As is expected, especially when dealing with this particular topic, the overall effect is that of violence. Experiencing this piece, as it continues to be written, will be discomforting and overtaking. This is especially important to me as it provides a space for the listener that elucidates some of the violence that is enacted upon the Black body at the hands of America’s political and socio-economic structures. 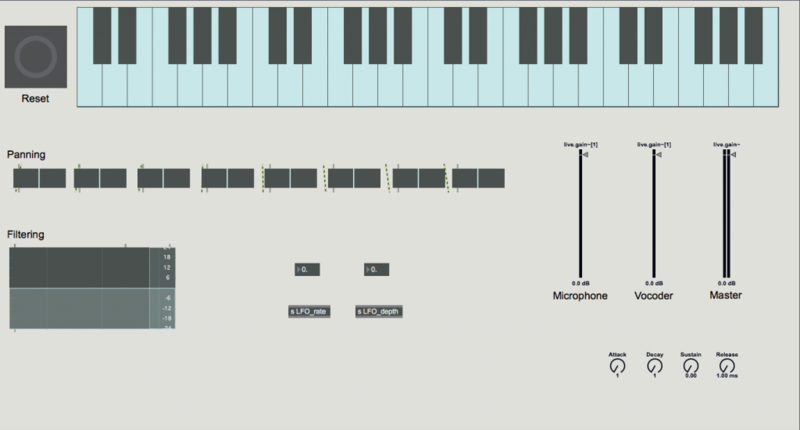 This is the interface for the software vocoder that I created and am using as one of the primary instruments in this project. The use of the vocoder is perhaps the most thrilling aspect of this project. I have been working on creating a software vocoder for much of the semester, and now that it is finally finished I am so pleased to use it in completing this project. As I alluded to in one of my blog posts, this instrument takes the human voice as input and replicates it at different frequencies. This process combines the distinct and soulful aspects of the human voice and digitizes it in order to manipulate it. In doing so the listener is left with what sounds like something that is almost human and is almost digital. The inclusion of instrument links the piece, aurally, to the tradition of science fiction. More importantly thought, this instrument sonifies the uncertainty of existence that is at the crux of the issue of Black embodiment. It accentuates the voices of those who feel disembodied due to racialization and parallels the struggle of the Black soul as it tries to reconcile itself with a physical form that is systemically rejected. This instrument, in essence, creates the perfect metaphor for the entire piece. 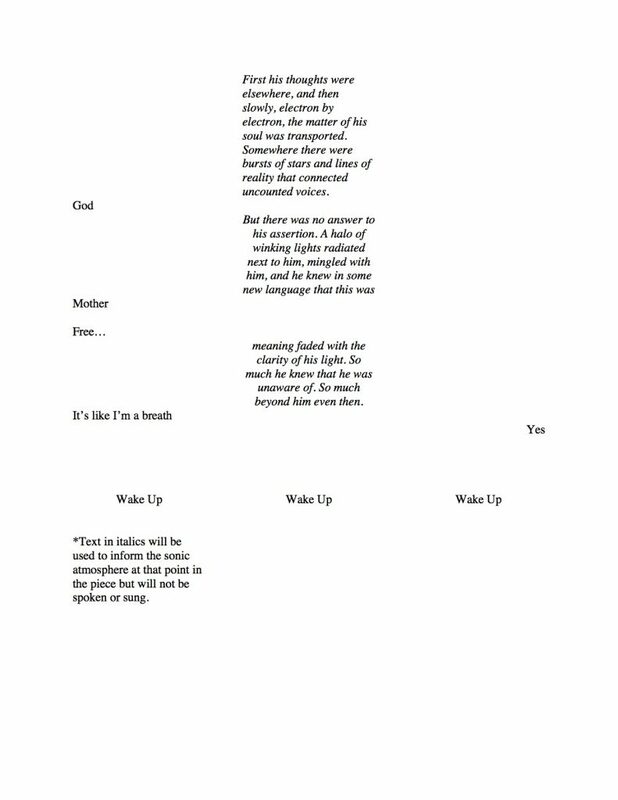 As I was writing and compiling the music and text, it became apparent that this combination of contemporary science fiction and classic American poetry created a uniquely fascinating junction point, at which the reader/listener is given the opportunity to explore the idea of social progress in this country under a different lens. The tenants of science fiction allow for the genre to always be one that pushes our current understanding of what is technically possible but also socially critical for our continued communal existence. In this way, Futureland does nothing that is earth shattering or groundbreaking by talking about race­ – there are other science fiction stories that attempt to tackle the same issue. However by pairing it with the text of Whitman, the listener/reader is forced to confront the completely different manifestations of America and American ideals that are in each text. Because of this, I’m quite interested in continuing this piece to its completion, but also in expanding this project to a song cycle of textual juxtapositions that provide a space for the nuanced and extremely influential aspects of Black life in America. Fortunately, the entire body of American literature, as we have discovered this semester, is equipped to speak to, at least in part, the issue of race in America as it was and is currently inextricable from the environment in which all artists who call themselves American live. I had originally intended for this project to result in a completed and recorded final version of a setting of these texts. After committing to my methodologies surrounding lyric generation in multiple forms, the completion and addition of my own vocoder as an instrument, and expanding the project further to be a major musical work rather than a 2-3 minute song, I feel as though I have the processes in place to continue this project while preserving the artistic integrity of this performance of these American texts. Expanding on this even further, as this piece hopefully transforms into a song cycle, the exciting opportunity for an interactive live performance of these pieces – complete with the vocoder, live electronic music, and lighting –seems on the horizon. These types of live, theatrical, performances of texts that are continually shaping the American social landscape, calls to me as a standout form in which to experience American literature in our current time.